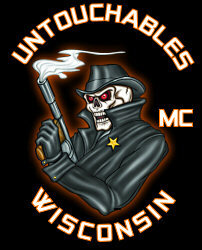 The Wisconsin Chapter of the Untouchables Motorcycle Club welcomes you. The UMC was founded by and consists of active and retired law enforcement officers that own and ride American-made motorcycles...No explanation required! We take great pride in the fact that this organization advocates a code of professionalism and ethics that are beyond reproach. The UMC was founded by and consists of active and retired law enforcement officers that own and ride American-made motorcycles... No explanation required! Members: Check out the forum for important information related to upcoming events.